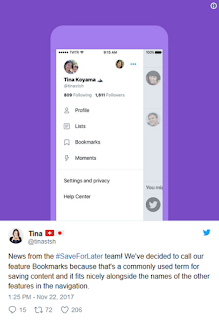 Twitter has come up with a new feature called "Bookmarks" that will appear in the lists on the sidebar. So let's say you have received a tweet from your cousin's best friend's dental hygienist's step son. In other words, it isn't an urgent bit of communications and in fact, you'd rather save it to read later. 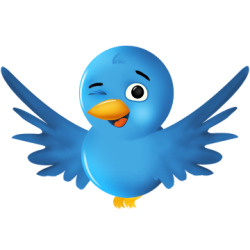 Right now, hitting the "Like" button is the only way to save the tweet, and by clicking on "Like," you might be giving a false impression about how you feel about this particular tweet. In a demo that Twitter demonstrated last month, the user pressed the "..." icon and clicked on 'add to bookmarks.' That saved the tweet until the user was ready to read it. At this point in time, there is no word on when we might see Bookmarks rollout to Twitter users world-wide. However, it is a useful feature that we're sure that Twitter fans will take advantage of once it has been officially added to the app.